​Manchester City Women host Chelsea Women on Sunday afternoon, as they battle it out in the second Women's FA Cup semi-final. The Citizens will be eager to gain revenge on the west Londoners, who beat them at this exact stage in last season's competition en route to lifting the famous trophy at Wembley Stadium. City are in excellent form this season, having not lost in 23 games and remaining unbeaten in domestic affairs. They reached the final four in style, beating Watford, Tottenham and Liverpool. Here's a look at manager Nick Cushing's best available ​Manchester City lineup ​to face Chelsea in the FA Cup. Karen Bardsley (GK) - Though Cushing has previously opted for reserve goalkeeper Ellie Roebuck in this competition, Bardsley is likely to get the nod. The 34-year-old American is one of City's most experienced players, having played in Manchester for almost five years now. Abbie McManus (RB) - McManus should start at full back on Sunday, as she searches for her seventh major honour with the Citizens. The 26-year-old has been at Manchester City since her youth career, and has been apart of the senior squad for over nine years. Steph Houghton (CB) - By far City's most decorated and experienced player, Houghton will play at the heart of the defence. The England and Citizens captain has had an illustrious career for both club and country, with 14 total major honours and 104 international caps. Jennifer Beattie (CB) - Beattie is likely to partner up with Houghton on Sunday, as she makes up Cushing's preferred centre back partnership. The Scotland international is just as experienced as her defensive partner, with an impressive 120 caps for her national side. Demi Stokes (LB) -​ Cushing should deploy Stokes at left back, as she makes up a solid back line for City. The 27-year-old has been in solid form this season, and will be looking to continue her strong campaign with the visit of Chelsea. Tessa Wullaert (RM) - Wullaert will start as a winger against Chelsea, as she offers a dynamic option to Manchester City's attack. The Belgian forward is her nation's all time leading goalscorer, having scored 39 goals in 78 caps for the Red Devils. Caroline Weir (CM) - Weir should play as a central midfielder on Sunday, as she continues her excellent debut season for City. The 23-year-old has been brilliant since joining from Liverpool last summer, winning the Player of the Match award in their Continental Cup final triumph. Jill Scott (CM) - Though Cushing has many central midfield options at his disposal, it looks likely that Scott will start alongside Weir. The 32-year-old is one of England's most capped players of all time, with a remarkable 130 caps to her name. Keira Walsh (LM) -​ Walsh should start as a left winger at the Academy Stadium, completing a strong City midfield. The young midfielder has been a City regular since joining in 2014, winning four trophies in her time with the Citizens. Georgia Stanway (ST) - City's key strength is their deadly attack, with Stanway likely to make up one half of it on Sunday. Having ​recently signed a new contract with the Citizens, the 20-year-old youngster has scored 11 league goals this season. 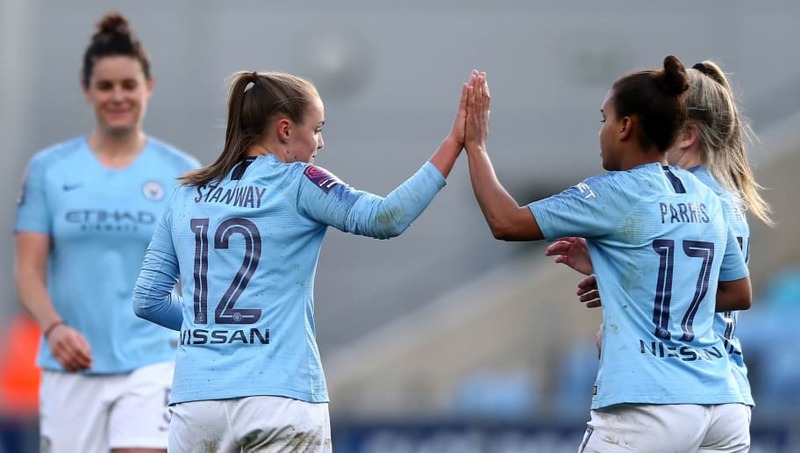 Nikita Parris (ST) - Parris will be eager to produce another super performance against Chelsea, having scored a brace in their last meeting in February. She is also in outstanding form for City, with an excellent league record of 18 goals and six assists.